Building a cleanroom is simple when you come to UltrapureTechnology.com for your cleanroom equipment. We offer a wide array of cleanroom supplies, including HEPA filtered gowing cabinet, desiccators, dry boxes, and weighing stations. For example, if you are looking for a cleanroom air shower and not sure where to turn, you can contact us and discuss your needs. We know all about these great pieces of technology and are prepared to assist you. It doesn’t matter if you have already built your cleanroom or are just searching for new cleanroom supplies, our business has the products to help you complete your project. We work quickly because we want to make sure you are always successful. Contact us today to ask questions about our cleanroom equipment and learn more about ordering a cleanroom air shower, UV PCR cabinet, or lab storage cabinet. Our team is prepared to help you build your cleanroom with ease. Air Showers can solve many decontamination problems by offering an effective way of reducing the contaminants carried by individuals entering or leaving a controlled area. Single-person Air Showers to multi-section tunnels are available to accommodate our customers specific needs. The Air Showers supply concentrated ISO Class 5 (Class 100) airflows to lift off contamination while the individual stands in or walks through the chamber. Pressurized air streams at a velocity ranging from 6,000-10,000 feet per minute to ensure the effective scrubbing action which is necessary to remove particulate matter. 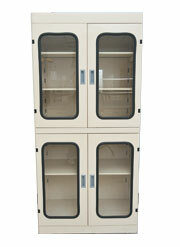 Maintain all of your cleanroom garments and gloves in a HEPA fitlered gowning cabinet. Available with wire or perforated stainless steel shelves, clear polycarbonate doors with stainless steel piano hinges anodized aluminum air relief grilles. Construction can be stainless steel, powder coated steel, polypropylene, or plastic laminate. Nonshedding materials ensure cleanroom compatibility. 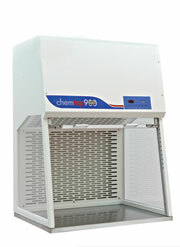 Provides excellent storage for cleanroom garments, gloves and wipers. 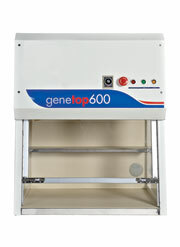 Preserves moisture-sensitive wafers in a dry, particle-free environment. Automated nitrogen controls maintain user-selected humidity level (ambient down to 0% RH). Engineered for optimal storage density of 200mm or 300mm wafers (in most standard cassettes and lot boxes). Available in strong, rigid acrylic or static-dissipative PVC, which protects against static charges and the particles they attract. Advanced construction features include plenum chamber, 304 stainless steel door frames, LiftLatches, and one-piece front sealing panel. 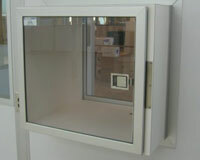 Prefabricated unit used to pass items to and from a contamination controlled environment. Standard clean room construction completely sealed, exterior surface covered with white vertical grade plastic laminated doors of .375 clear acrylic or 1/4 polycarbonate material fastened by continuous hinge. Wind speed (open window mode) at 0.6+0.1 m/s.